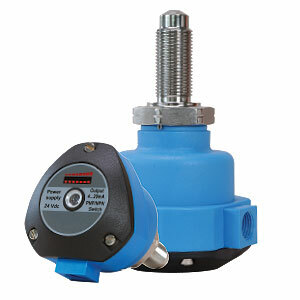 The FSW-9000 Series is a flow switch monitor that measures the velocity of the flow. It is ideal for use in measurement and control liquid applications. The FSW-9000 Series provides two output options: a 4 to 20mA analog output and a PNP/NPN output. For the 4 to 20 mA output, the electronics’ module converts the signal from the probe to a 4 to 20 mA analog output, which can be used to indicate flow rate. For the PNP/NPN output, the measured flow rate is compared to the setpoint value selected by the user and the switch changes state once the setpoint value has been achieved. The FSW-9000 Series microprocessor based electronics and unique self-calibration program gives the flow switch superior temperature compensation, a fast response time (adjustable from 3 to 10 seconds) and increased long term switch point stability. Even in the event of a power failure, the calibration program will store values for maximum and minimum flows for up to 10 years. A chain of 8 LEDs gives the user a visual indication of the flow rate as well as setpoint status, and one di-chromatic LED indicates switch point status. In addition, if there is a problem with the unit, the 8 LEDs will flash continuously providing troubleshooting information. The conical shape of the sensor’s tip means that the probe can be installed at almost any angle in the pipe and that if the probe is misaligned, accuracy will not be affected. The sensing element and connection of the FSW-9000 Series are made with 316 SS and the standard enclosure is glass-filled nylon. The FSW-9000 Series can be made with a great variety of process connections such as threaded, flange, or sanitary and is also available in an aluminum enclosure for hazardous environments. Intrinsic safety barriers required for explosion proof areas. Please note that the 4 to 20 mA option is scaled over 0 to 2.0 m/s. The FSW-90-R is very similar to the FSW-9000 Series with one main difference: The sensor is separate from the electronics and it does not have an enclosed housing. This gives the FSW-90-R Series the ability to be installed in very small pipes and be remotely controlled by the FSCN-91 relay. The FSW-90-R Series is the ideal solution when there is not a lot of space to install even a compact unit or when there is a need for a mounted relay. FSCN-91 relay can operate with DC or AC supply voltage and provides an analog 4 to 20 mA and SPDT output. The FSCN-91 enclosure is made with ABS and can be mounted on a DIN rail or by using 2 fixing screws. For ECTFE/ETFE coating, add suffix "-ETFE" to model number, add $200 to price.